Despite embroideryand silk printing, heat transfer printing are the most popular processing methods for T-shirts/Hoodies/Polo-shirts and all other Promotion Apparel Decorative. Right now, we have a third way, which is lettering. 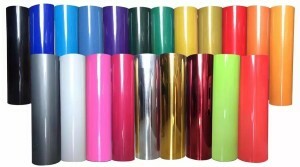 These letterring film are mainly single colors and won’t be fade. In the most, when it comes to 1 color printing, we are mainly turn to silk printing, to save cost. But the fact is that silk printing images or texts will fall and broken into pcs when washed a few times. People want better quality, then letterring come in. We have a lot colors for letterring films, such as white/black/red/silver/blue/green/grey etc(see below), won’t need printing plates, just the same printing steps as heat transfer, top quality easy to print, cost quite affoardable. No mater you are are interested, welcome to contact sales@hichinaprinting.com, we can print your T-shirts, or provide you these top quality materials in roll.